Israel joyously celebrated Independence Day on May 2 and the Palestinians commemorate the same event today with mourning and civil disobedience. It begs to ask the question; Is peace a zero-sum game? Does someone have to win at another’s expense? The different dates are because the Israeli’s use the Jewish, lunar calendar and the Palestinians, the solar Gregorian. Dr. Ismail and I are here to further the Bridge to Peace project of the Alliance for Oral Health Across Borders that already exists. The bridge however, needs reinforcement and support. It requires new abutments and stronger girders. Perhaps the best part of the trip so far is really getting to know Dean Ismail. He is a man of vision and action. He thinks out of the box and is able to inspire others. He’s certainly inspired me with his vision of peace and tolerance. On this trip, I hoped to visit the 3 area dental schools which already participate as well as the DVI clinic and Shalva program for special needs children to see how they can be incorporated into the Bridge. Today, I was told that I shouldn’t go to Al Quds. At first, I thought it was because of security reasons and The Nakba. After speaking with Dean Ismail, who did go, I realized that my presence would have been incendiary (American Jew with Israeli ties) to some of the faculty. So Dean Bajali asked that I not come. Talk about politics? Instead, I hope to meet with Dean Bajali tomorrow afternoon. And so, I had some free time. I went to the DVI clinic, where I met Dr. Bers from Maryland (he’s one of our devoted board members) as well as Dr. Chase from Texas, who is volunteering for his second time. I made some inquiries about the security and safety in the Old City and was told the only Nakba-related issues were in Hebron and Ramallah. And so, I made my way to the Old City. 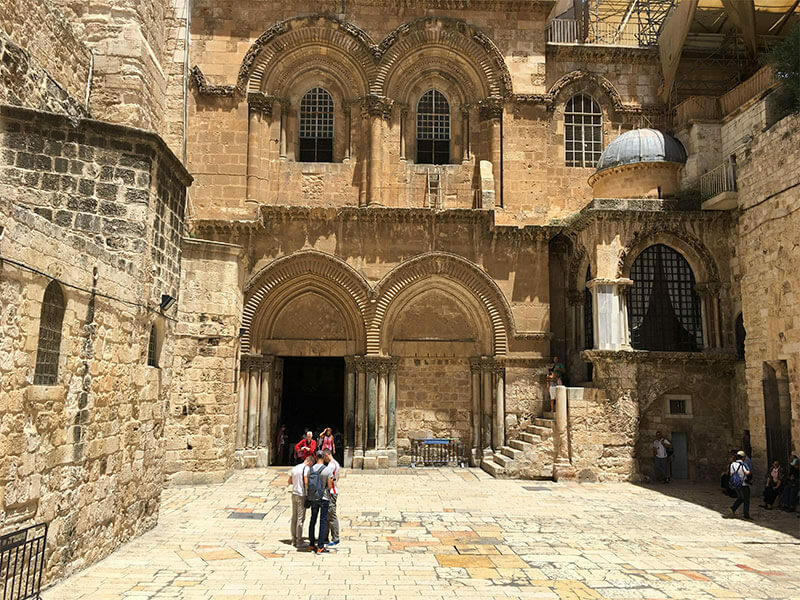 I purchased some Olive wood rosaries and went to the Church of the Holy Sepulcher and rubbed them on the Stone Of Anointing. I love giving these to people who appreciate their significance. I went to the Western Wall plaza. I’m never unmoved when I see the Mosque and Dome of the Rock. It has always impressed me that since 1976, when Jerusalem has been United, for the most part all the religions have coexisted peacefully. 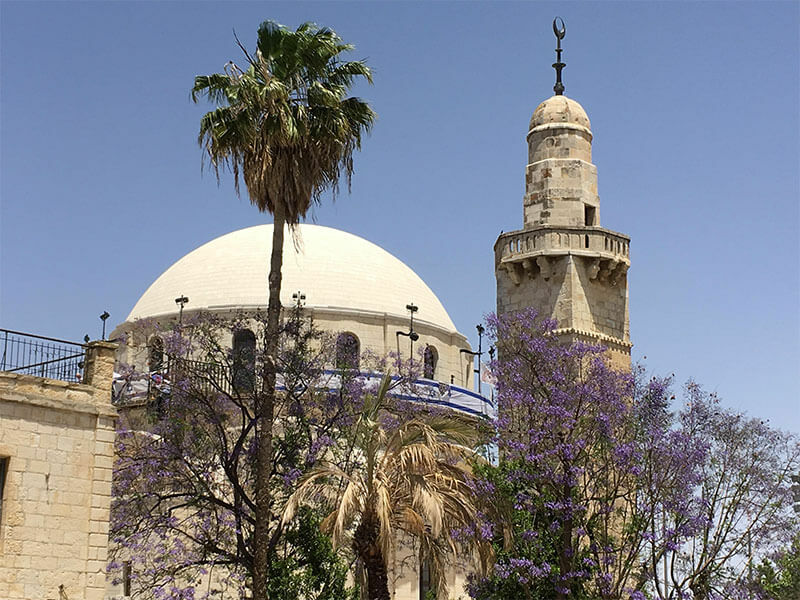 Sure, there have been some incidents but the Old City, with its Moslem, Christian, Armenian and Jewish quarters have remained a model of tolerance. Too bad the rest of the World doesn’t learn from the example. Dean Ismail put it well. Dogma is the enemy of compromise. The Hurva Synagogue next to a Mosque. I usually have a routine of getting a falafel at my favorite place in the Old City. With my no-grain diet, that would have been an temptation I’m not sure I could have resisted. The problem was solved when I passed the place and saw it was closed. A sign? 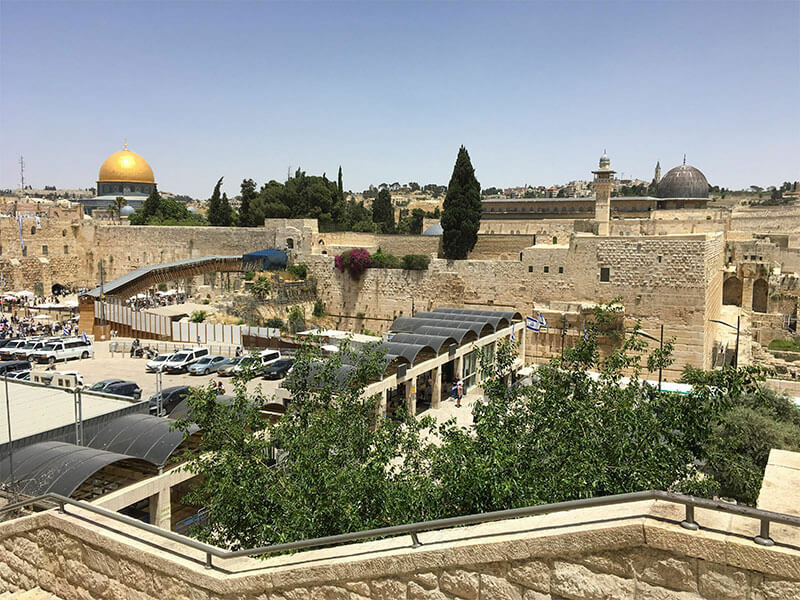 The City of Jerusalem is a contradiction wrapped in an enigma. Inconsistencies are rampant as religions collide with the present, the past and technology. It’s dizzying watching. I’m not sure Mel Brooks or Saturday night live could have come up with this. I don’t believe this is a zero sum game. I believe a compromise is possible. The alternative is untenable and unsustainable.